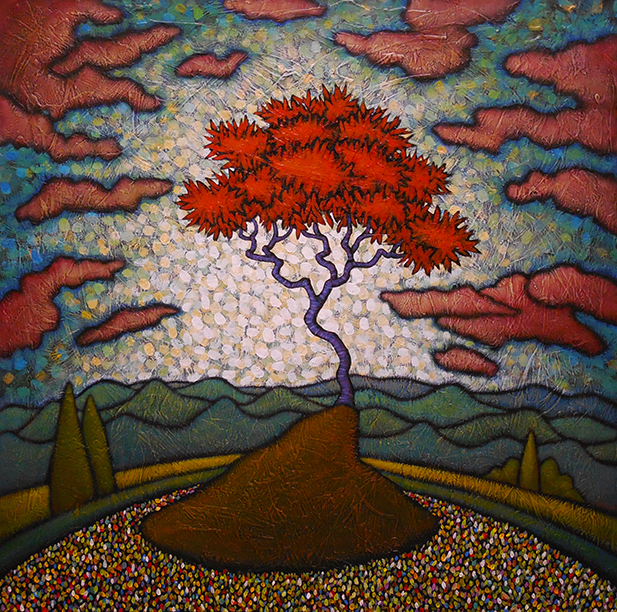 I think of many of the paintings that I do with the Red Tree situated very much front and center as being a portrait of sorts. I see a face and head and shoulders set against the background. Sometimes I see the familiar faces of others in them and sometimes they feel like self-portraits. I definitely this painting, a 36″ by 36″ painting on canvas that is titled Find Your Light, see as a self-portrait. If someone asked for my picture I would prefer giving this image rather than an actual photo of myself. Maybe I am being vain in thinking that it resembles any part of me but I can at least hope it represents the better part of me because there is a lot that l like in this painting. I like the field of colors that acts as a garment shrouding the chest and neck of this portrait. I like the burst of brightness that comes from the center set against the multitude of deeper colors that surround it. And I like the bands of blue-green hills that seem like a coat loosely draped on the shoulders of the portrait’s subject. And the layers of color within the clouds and the soft glow of blue that surrounds them. All these things combined with the impact of the painting’s size give it a quality that appeals to me, one that feels like a sense of self being clearly and confidently stated. That’s a quality that I hope for myself and for my work. I guess that is why I see it in some way as a self-portrait. Maybe you see yourself in it? That would equally please me. This painting, Find Your Light, is now hanging at the West End Gallery as part of my solo show, The Rising, which opens Friday, July 13.